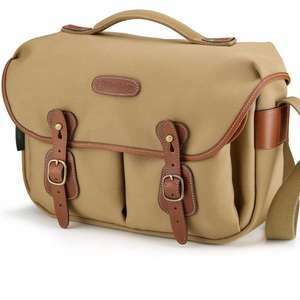 The Hadley Pro in khaki canvas and tan leather trim has an added carry handle for portability and a stiffened top flap to give added security as the handle is stitched to the stiffener and not the canvas. It has a fully removable insert with dividers, which can be adjusted using the velcro fastenings. The fully zippered, waterproof rear pocket is useful for everyday bits and pieces which need to be kept safe and secure. The insert lifts out in one movement and the bag has been designed to take the Billingham AVEA attachments for added capacity. The darted main flap locks into place with two adjustable quick release straps which have attractive brass buckles and the fully adjsutable shoulder strap is firmly stitched into place and then has a further leather patch to ensure absolute security. The front pouch pockets have press stud fasteners. The black bag has a black interior for added impact.